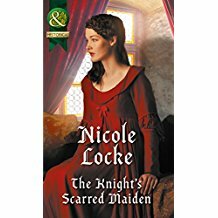 This the first book that I have read of Nicole's and it won't be the last, I loved reading every second of this book. I can highly recommend this book. I won't reveal too much but will say a little on the characters. Helissent was eight when she scarred by a fire, when she was trying to save her four year old sister Aimee, but all of Helissent's family perished in the fire and Helissent was left scarred on the entire right side of her body. From here Helissent was healed by Agnes for a year and then John and Anne brought Helissent up at their Inn, and then she looked after them before they died. The inn was then run by the owners son Rudd, (you will know more about him in the book). Helissent has always thought she was a coward. But from I have read she is anything but, she is strong, brave and courageous, also I would love to try the honey cakes. Its through these honey cakes that she meets Rhain. Rhain has been a mercenary for five years, he had set out to find his father, he carries a sampler with a design and is trying to find the pendant for the necklace that he also has. Rhain grew up with his older brother Teague and his parents William, Lord of Gwalchdu and his wife Ellen. (From here I don't want to spoil what happens it might spoil the story). I found Rhain that on the outside he didn't want to get close to people and that included his friend Nicholas, but on the inside he had a good heart and he wanted to protect Helissent not just from himself but from other people. He also thought Helissent was brave and courageous for trying to help her little sister. He is also on the run from Reynold who is after Rhain for killing his brother Guy. (I won't go into detail over this you will find out in the book). I would give this book 5/5 stars. A must read.